Last Sunday Macclesfield U16’s had 7 players representing Cheshire U16’s vs Lancashire. Cheshire won both games. 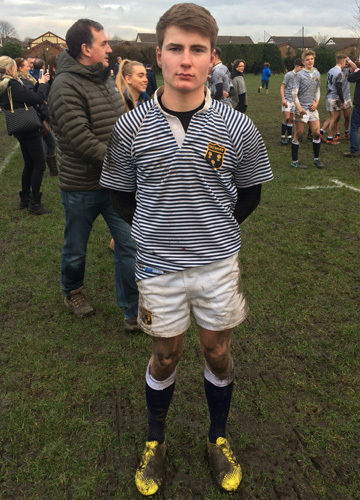 The B team game was won 29-0 with our own Harry Oliver scoring a try and Will Davies, the Captain for the day kicking 3 conversions. Pictured are the players after the game, good to see someone else’s pitches are the same as ours!! L to R – Will Davies, Harry Wheelton, Lewis Halliday, Harry Oliver, Toby Moule, Harry Harding. This week sees the U16’s travel to the Wirral in the Cheshire Cup ¼ finals.